Visit my NEW Ponds page! Visit my NEW Clematis page! Garden Forever: Gardening for people of all ages, abilities and lifestyles. If I could have but one wish it would be to garden forever. A place to read about how other people manage to continue to garden. In articles about the soothing effect of gardening, gardens in the sky (roof top gardens), overcoming health problems, gardens that shine in the evening, programs that help people, children, the elderly, the physically challenged, plus practical tips and ideas, we'll explore and highlight ways to help us all Garden Forever. Help support horticulture therapy groups, community gardens, seniors' & children's gardening programs. 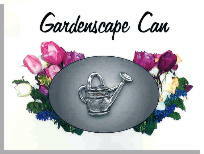 Buy a Gardenscape Can lapel pin - just $10 with $5. from every sale going towards groups that help others garden forever. The Horticultural Therapy Program of The Holden Arboretum, purpose is to: enable individuals with special needs to benefit from therapy through horticulture by engaging professionals in educational programs, providing therapeutic programming and instigating research. 'SUSAN'S DISABLED GARDENING PAGE' Personal page and lots of information for disabled and non-disabled gardeners. Do want to learn more about Gardening? Check out my favorite links in: 'SUSAN'S GARDENLINKS PAGE' Lots of links for disabled and non-disabled gardeners. Enabling Tools - a page of tools that help gardeners do what they love to do - garden. Sometimes an enabling tool is not that much different from a regular tool - it can be the way a handle is gripped, a little extra length in the handle to prevent extra bending or stretching, a padded seat that lets the person garden more comfortably from a sitting position. Accessible Gardening for Therapeutic Horticulture - Jean Larson, Horticultural Therapist Anne Hancheck, former Minnesota Extension Horticulturalist Paula Vollmar, Horticultural Therapy Intern, University of Minnesota Regents of the University of Minnesota. Do you recall times in the garden when, after weeding a row of flowers, you had more energy? Or after a walk outdoors, you felt more peaceful? 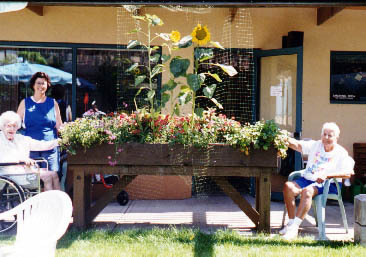 If so, you experienced the therapeutic benefits of horticulture, and you are one of many who retreat to the garden to relax, renew energy, create a sense of place, and restore self-esteem.Therapeutic Horticulture is the purposeful use of plants and plant-related activities to promote health and wellness for an individual or group. GARDENING FOR PEOPLE WITH DISABILITIES: You can still have a garden to be proud of...all you need is some specially designed equipment. The Enabling Garden by Gene Rothert Gardening has been proven to be therapeutic, partially accounting for its status as America's #1 leisure-time activity. 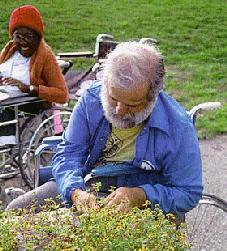 THE ENABLING GARDEN (Taylor Publishing; 1994; $12.95) goes a step further by showing how the disabled and the elderly can create their own user-friendly gardens. The focus is on establishing an environment that enables anyone to enjoy gardening: it is chock-full of ideas and information about helpful gadgets, modified techniques, and tips to make garden maintenance more manageable. Gardening Tips for People with Impaired Vision - Gardening is one of the most popular leisure activities of Americans. Many people think that vision impairment will prevent them from enjoying their gardens. Not so! The French painter, Claude Monet, was an avid gardener who loved flowers almost as much as he did painting. Although Monet eventually lost most of his vision, he did not stop painting, nor did he ever lose his love for gardening. Vision impairment does not have to spoil your enjoyment of gardening, either. Thank you for shopping with GARDENS, an Amazon.com Associate. © 1998, 1999, 2000 Gardens. All Rights Reserved. Do not duplicate without permission.